What a summer of poisoning it has been! At an international level we learned that President Putin had started employing tasters to check that there was nothing untoward in his food. In the UK, the government announced its plans to hold a public enquiry into the death by radiation poisoning of the Russian secret agent Alexander Litvinenko. And on a much smaller scale, but one of personal importance, there has been an ‘epidemic’ of poisonous weever fish in Cornwall and Brittany. These sly fish, who can emit a most painful toxin from their dorsal spines, bury themselves in the sand and when stepped on inject the poison into the offending foot. One such foot belonged to my youngest son Oliver and the pain, swelling and local discolouration lasted days. The epidemic is such that the lifeguards at our local beach are treating one victim a day and are advising bathers either to buy plastic swimming shoes or to pray – we went for the footwear option! In no way wishing to diminish the importance of these stories of human woe, there has also been a poisoning saga even closer to home – this has involved a dog, a toad and two anthropomorphising human beings. At present we have our second son’s dachshund Lupie staying with us [see The north wind doth infrequently blow, Greyhares, 2 July 2014]. A wire-netting fence limits Lupie’s wanderings to the house end of our garden and she patrols this area meticulously, often needing to dig holes in the lawn and the flower beds. She barks when faced with challenges both real or imagined – by this I mean those challenges which have no cause obvious to humans. One evening the barking was more intense than usual and her tail was wagging with more purpose. We discovered that she had found a gigantic, yellowy-green, carbuncle-covered toad of whom she clearly did not approve. Interestingly, the toad remained as much unconcerned as Lupie was agitated. Worried for the toad I picked it up and carefully moved it to the far side of the fence, within hopping distance of a stream. 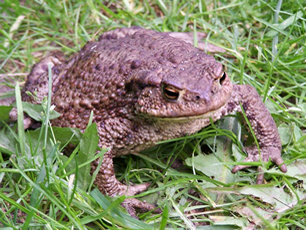 We dipped into Wikipedia and learned that our toad was a member of the protected species bufo bufo. She was female (males are smaller), and with a body measuring over 12cm in length was fully mature; possibly over 30 years old. The carbuncles on her back would be full of a powerful and unpleasant-tasting poison to be secreted if attacked by predators and it works – her only serious challenges come from droughts and cars! If swallowed, the poison is strong enough to kill a dog; an early sign of such poisoning being excessive salivation. The penny dropped. Just a few hours earlier Lupie had suddenly started foaming at the mouth, rubbing her muzzle and drinking water. My wife had wondered if she had eaten a mouthful of ants but none were to be found. Now the story was becoming clearer – her lips and tongue must have touched Madame Bufo bufo’s back. Fortunately, after an hour or so Lupie had fully recovered and the incident was forgotten. Armed with our new understanding we went to check on Mrs Toad to find her trying to get back over the fence to regain the site from which she was so abruptly evacuated. She was very determined and we watched her climb ten or so centimetres, only to fall back and then start again. These attempts continued for at least three hours and all the time she was making faint ‘pipping’ noises. We went to bed and left her to this somewhat bizarre homing behaviour. By next morning she had vanished. Naturally we discussed finding her and saw her in part as a fat, ugly, sluggish, poisonous toad who might have killed a dog we were looking after, and in part as a cranky but successful old lady who had survived for years in difficult circumstances and whom it was a privilege to meet and possibly even save. Ten days later Lupie started barking again in the same flower bed and with the same intensity. This time we found a smaller toad of the same species – the male – who must have come out of hiding. He too was gently lifted over the fence to safety. Predictably, we assumed it was to him our old lady had been calling and whose company she tried so hard to regain. And somehow, poison or no poison, we suddenly saw her as almost human. In our romantic and anthropomorphising way, despite her ugliness, her deadly pustules and her part in a near calamity, she was forgiven. There must be a parable in that! I write on behalf of the toad community to object to your narrow minded and ageist comments on one of our most venerated members. To call her “almost human” is the biggest insult imaginable. At least in our community we never attack others. Please turn your criticisms on, and control, your own murderous members and stop forcibly displacing us. Furthermore, on behalf of the Dackel Bundesrepublik, I must demand that our citizen, the prisoner you refer to as “Lupie” (she is known among dogs as Zelda der Großen, Dachs Krieger) must be released immediately and allowed to resume her pursuit of rodents and small mammals without further let or hindrance.